Grow and decorate your own little world with this terrarium kit! Inlcudes 9"x 7" x 5" terrarium, drip tray, paint brush and eight assorted paint colors. Be creative and mix the paints for additional colors. Plants and soil not included. Recommended for ages 8 years and up. Terrarium measures 9"x 7" x 5". 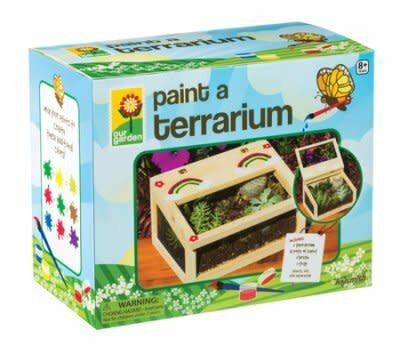 Includes terrarium, drip tray, paint brush and eight assorted paint colors.